Genes that play a role in the development and progression of cancer are called driver genes. Currently, small molecule compounds and antibody drugs for this driver gene are being developed in many cancers, but some genes are difficult to discover. CRISPRi is a new technology that can solve the problems of conventional targeted drug development and can be the basis of the development of therapeutic regimens for undeveloped cancer drugs with low development cost. Associate Professor Takuya Fukazawa of Kawasaki Medical University, Associate Professor (Lecturer) Tetsushi Sakuma of Hiroshima University and Chief Toshikazu Ushijima of the National Cancer Center Research Institute, etc. are members of this study. Supported by the program of Practical Research for Innovative Cancer Control, Japan Agency for Medical Research and Development (AMED) "Development and application of vectors for epigenome editing that multiply regulate the expression of cancer-related gene" (Research Representative: Tetsushi Sakuma), the Fukazawa research team succeeded in inhibiting the proliferation of cancer using transcriptional regulation technology of the target gene repurposed from genomic editing called CRISPR interference (CRISPRi). It is the world's first effort to apply innovative multi-guide CRISPRi technology that can target multiple genomic regions at once. With the spread of next generation sequencing methods, genomic editing technology capable of precisely modifying genes has been rapidly advanced and used in advanced research in multiple fields as many human genome information is decoded in a short time. With the development of CRISPR/Cas9 applying the immune mechanism of archaea etc., deletion and insertion of the nucleotide sequence at arbitrary position on the genome can be easily performed (Fig. 1). Many genes necessary for life support are expressed and read in the human body, but its expression regulation is usually carried out by binding multiple transcription factors to the DNA region called promoter. 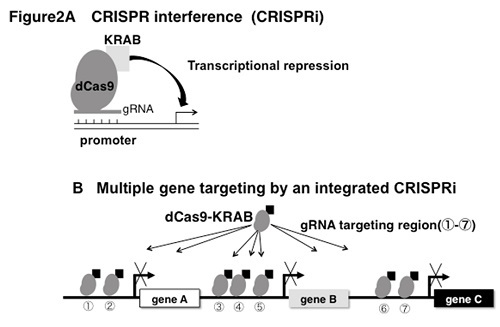 The multi-guide CRISPRi developed this time expresses Cas9 not cleaving the genome (dCas9) that fused the transcription repressing domain (KRAB) in the cancer cell at the same time as the guide RNA (gRNA) containing the target sequence, which can bind it to the targeted place on the promoter of the driver gene to be done. As a result, gene information cannot be read and the gene does not work (Fig. 2A). Multi-guide means that it can express multiple gRNAs specifying any position on the chromosome at the same time. By using multiple gRNAs for one gene, stronger suppression of expression can be realized and several target genes can be prevented from working simultaneously (Fig. 2B). They applied this technique and developed a new therapy for lung cancer and esophageal cancer this time (Japanese Patent Application No. 2018-081795, entitled "Pharmaceutical Composition for Treating Proliferative Disease" filing date: April 20, 2018, applicant: Hiroshima University). By changing the sequence of gRNA, this multi-guide CRISPRi can suppress the expression of not only the ΔNp63 gene but also other genes, so it is expected to be applied to various types of cancers. 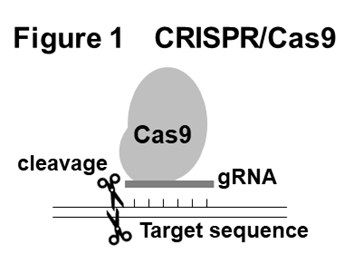 Currently, contrary to CRISPRi, we are also conducting basic research aiming at the development of a novel CRISPRa (CRISPR activation) technology that increases the expression level of a target gene and its application to cancer treatment. “This system is expected as an innovative technology applicable also to diseases related to cancer other than cancer.” said Fukazawa.